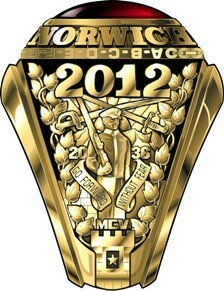 The Norwich class ring is presented to the Junior Class members of the Corps at the Junior Ring Ceremony. The Norwich ring is the most prized of a cadet's worldly possessions, and much effort goes into earning the right to wear it. 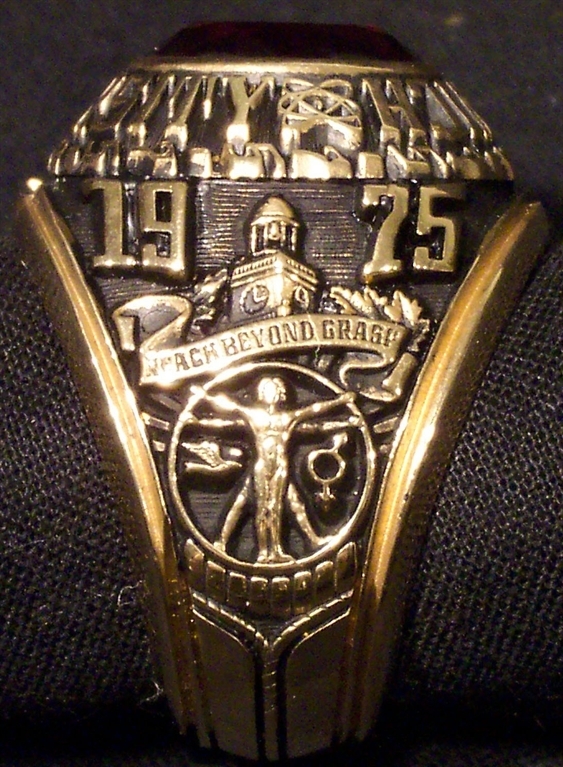 The ring tradition at Norwich began in the spring of 1923, when the senior class adopted a class ring for each member of the class who would graduate in June. It was expected that each class would follow the precedent of the class of 1923. 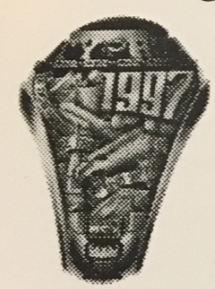 In time, the process of ring design and presentation shifted to the Junior year. However, it was not until the mid-1960s that a policy for standardization of the ring design was in place. 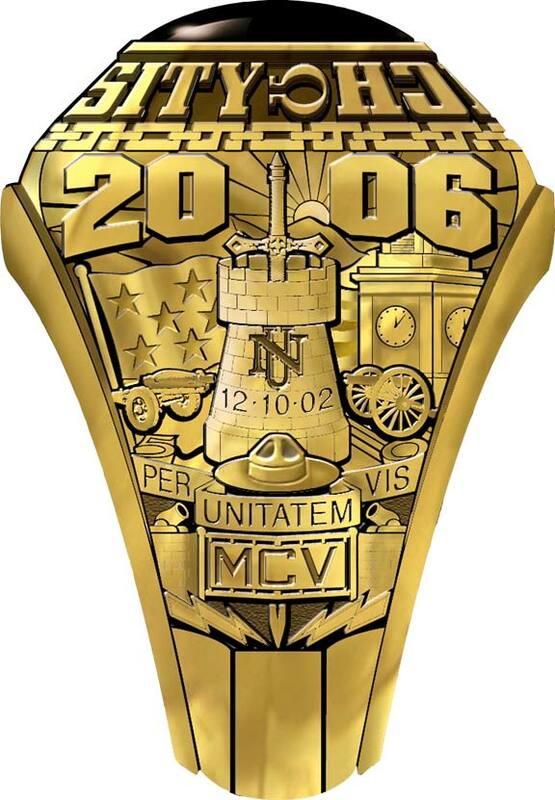 The Norwich rings, like the service academy rings, feature a class crest on one side and the school crest on the other, with a bezel surrounding a stone or similar inset on top. 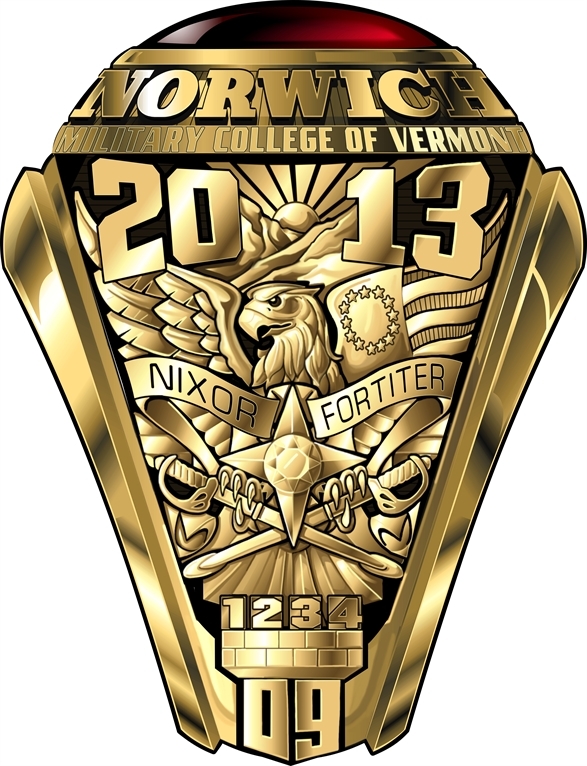 Tradition dictates that the cadet wear the class crest facing him/her until graduation, when the ring is turned around so that the Norwich crest faces the wearer. 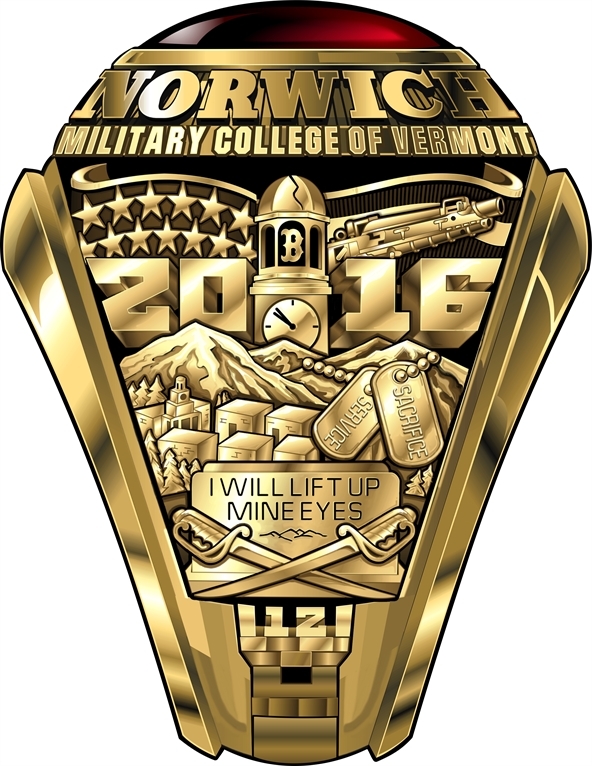 This tradition links the wearer more closely to his/her class until graduation and to all the Norwich Corps graduates after graduation. 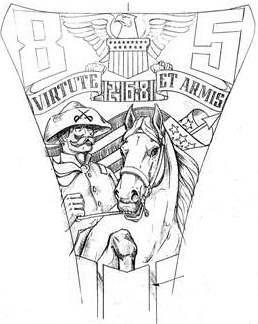 Flanking either side of the shield, they represent our kinship with Vermont's first cavalry. Today, cadet officers wear sabers in lieu of carrying rifles. 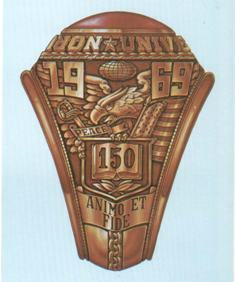 Flowing on either side of the shield, the scroll distinguishes those who wear the ring as members of the Norwich University Corps of Cadets. Depicts a cannon and an engineer's transit in the foreground of a mountain range, with the rays of the morning sun rising above it. The cannon represents the military heritage of the institution; an engineer's transit represents our academic mission. Finally, the rising sun over the Green Mountains represents the light of knowledge flowering on “The Hill.” The numerals 1819 hallmark the founding date of the University. Surmounted on the Norwich shield, symbolic of strength and courage in its depiction of both our school and as our national symbol. Superimposed upon the talons of the eagle, it stands for the fundamental attributes of character. Honor is a virtue which impels loyalty and courage, truthfulness and self respect, justice and generosity. A cadet's honor is never in question if he or she is true in thought, word, and deed. It was said to have been used as a rallying cry by a former president of the university, Truman Bishop Ransom, before his death as he charged a hill at the Battle of Chapultapec during the Mexican War. It conveys the spirit of the University and has been adopted as our motto: “I will try." 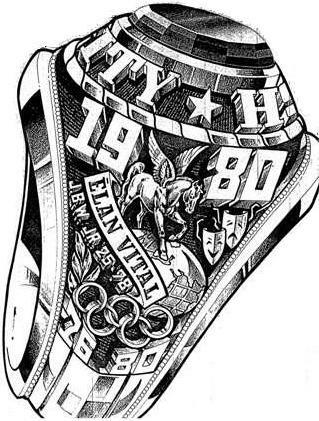 Each class is permitted to design one side of the ring. 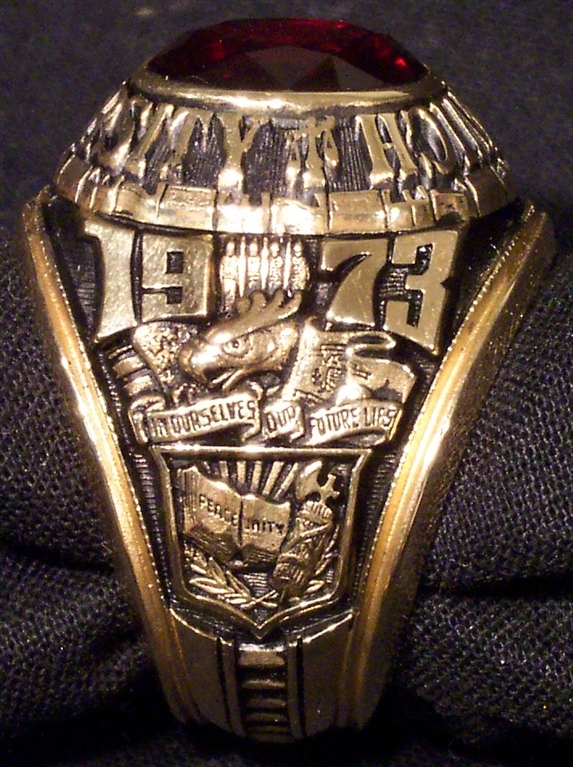 The second side of the class ring, however, must conform to a University standard in the interest of maintaining a distinctive tradition. Please note that we do not have descriptions or depictions of every class ring. 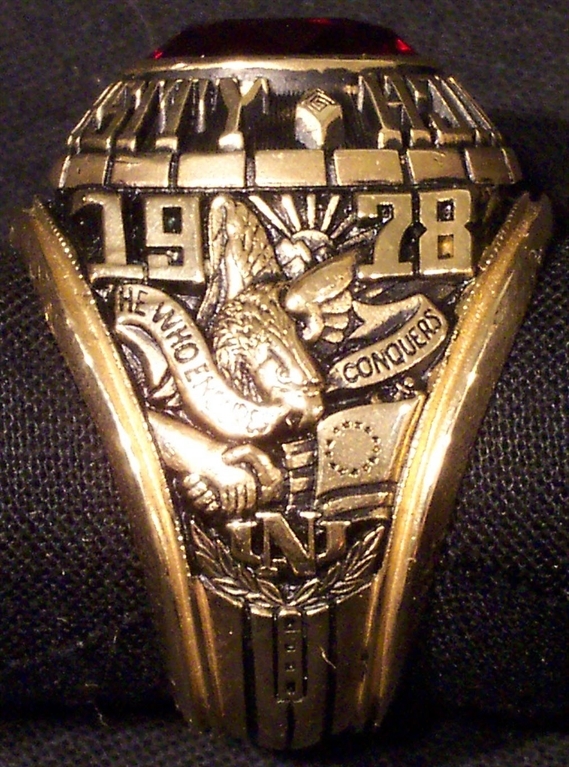 It is our goal to obtain and post pictures and descriptions of every Corps ring in chronological order so as to further bridge the connection to our proud past. If your class is not listed and you have information to share, we are more than happy to add a page! Send the request to alumni@norwich.edu. For questions on purchasing a replacement ring please contact Bill Passalacqua. 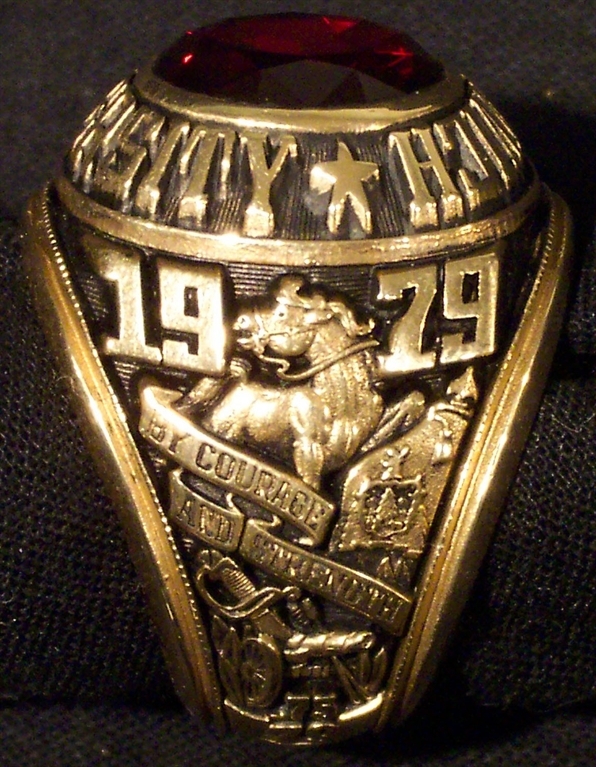 Click on a class ring below to learn more about that class' ring. Bald Eagle. An image of patriotism, pride, and strength, the bald eagle embodies what Norwich men and women strive to be, which is loyal and courageous in service to their country. The bald eagle possesses some of the sharpest eyes in the animal kingdom; their vision spans for miles as they soar hundreds of feet above the ground. Like eagles, Norwich cadets are always forward thinking, looking ahead to set and accomplish goals to better themselves and others. Cadets have the capacity to adequately anticipate and prepare for their futures, no matter the direction their life goes. The bald eagle embodies that vision and pride for which Norwich stands. Five Arrows. All of the military services are represented within the student body, and Norwich graduates have served with devotion for generations. The arrows represent the U.S Army, Marine Corps, Navy, Air Force, and Coast Guard and the many individuals who dedicate themselves to selfless service and to the mission of protecting the United States of America and its people. Sunrise. The sunrise represents the start of a new day and the start of a new era. The six subdued rays represent the six cadet training companies at the beginning of our Norwich career. The five prominent rays represent the restructuring of the corps and what is to follow in 2019. Compass Rose. Acting as a means of guidance for explorers of old and new, the compass rose and its significance has not faded with the passing of time. Daily, the large compass rose of granite outside of the Sullivan Museum and History Center is passed by hundreds of individuals, carrying on their busy lives. Just like that compass subtly connects the thriving members of those on campus, the compass rose on the ring serves as a perpetual reminder that after graduation, Norwich will persist as the enduring bond that connects the class of 2020, no matter where life brings us. Two Stars. To exemplify and depict great gratitude for all he has done for our class, we thank Major General Richard W. Schneider, VSM, 23rd president of Norwich University and retired rear admiral from the United States Coast Guard Reserves, for his leadership, maroon and gold spirit, values, integrity, legacy, and selfless service to Norwich and this great Republic. Bricks. Once laid end-to-end on the center walkway of the Upper Parade Ground, the bricks are now part of the physical memory of our campus landscape. We recall the bricks as we transformed from raw recruits to proud Norwich cadets. Howitzers. The sound of a cracking cannon fire rippling through the valley in which Norwich resides is illustrative of our nation’s oldest private military college. 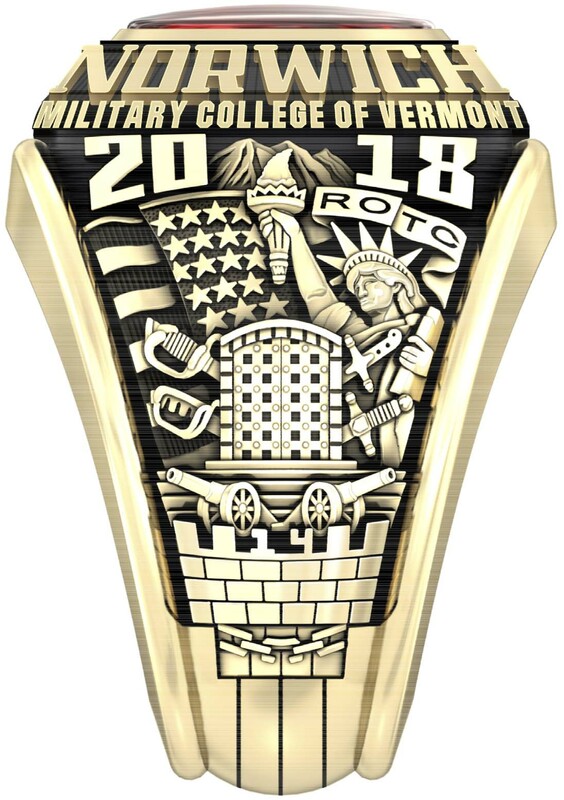 The howitzers act as bookends of our Norwich cadet experience upon arrival on the Hill as recruits on August 21, 2016 and concluding as Military College of Vermont graduates on May 9, 2020. From the early mornings of Rookdom, to the late night of recognition, to Junior Ring ceremony, and Commencement, the canon booms leave an indelible imprint on the memories we share of Norwich. Centennial Stairs. The Centennial Stairs mark the significance of Norwich’s past and present. As rooks, earning the privilege to descend the Centennial Stairs is a rite of passage, which is symbolized by the stairs being connected (joined) with the rook piece at the bottom of the ring. The stairs are a reminder of those who have ascended before us. Their collective accomplishments contribute to the legacy that is Norwich University and represent a long and storied history of excellence and service to others. Saber & Sword. The presence of the saber and sword illustrate a part of our history since our founding and cavalry days. The sword worn by a non-commissioned officer is positioned on the left and the officer saber on the right to symbolize the non-commissioned officer and officer relationship and their impact upon the Corps of Cadets. It also represents the transition from junior-year cadet non-commissioned officer positions to senior-year cadet officer positions. American Flag. The American flag represents freedom, sacrifice, and the values lived by every day as a cadet. Old Glory symbolizes the patriotism and service every Norwich cadet holds in their heart for the United States. She is an enduring symbol of freedom and democracy paid for by the ultimate sacrifice of our fallen heroes. Stars. 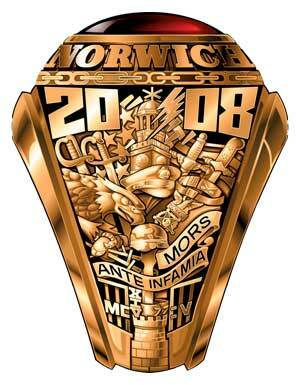 The four stars at the ring’s base represent the four branches of commissioned military service at Norwich. In addition, the stars represent Four-Star General Mark A. Milley, 39th Chief of Staff of the Army, and his keynote address to the Corps in recognition of the centennial celebration of the founding of ROTC at Norwich University, our nation’s oldest private military college. Mountains. The mountains mirror the view from Dole Cemetery, a destination for many ruck marches throughout our years in the cadet uniform. The four peaks depict the four-year journey on the Hill, and the challenges, physical, mental, and emotional, that every one of us encounters along our chosen path. Flowing through the mountains is the Dog River, which weaves alongside of our beautiful campus. Rocks. A tradition marked by the rocky beginning of the journey to become a cadet. The Dog River Run forges the solid foundation upon which we must build to earn our place in the Regiment upon recognition. Through trial and error, sweat and tears, we chip away at our rocky edges, in a symbolic way that transforms every cadet into Norwich men and women of the highest honor and integrity. Wreath. The wreath is composed of 19 individual leaves representing our graduation year of 2019. In keeping with the historical tradition, wreaths are often associated with excellence. 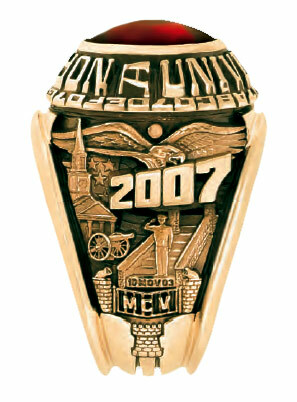 Its’ presence on our ring signifies that we are in constant pursuit of bettering ourselves to achieve excellence. Book. The book serves as a reminder of our school's rich history. Norwich tradition commenced in 1819 and will endure long after our class graduates. The Bicentennial Class is another page in Norwich's rich history. The book holds the honor of 200 years of proud military traditions. The open book allows for the cadet to always be willing to learn, lead, and live. Rook Piece. 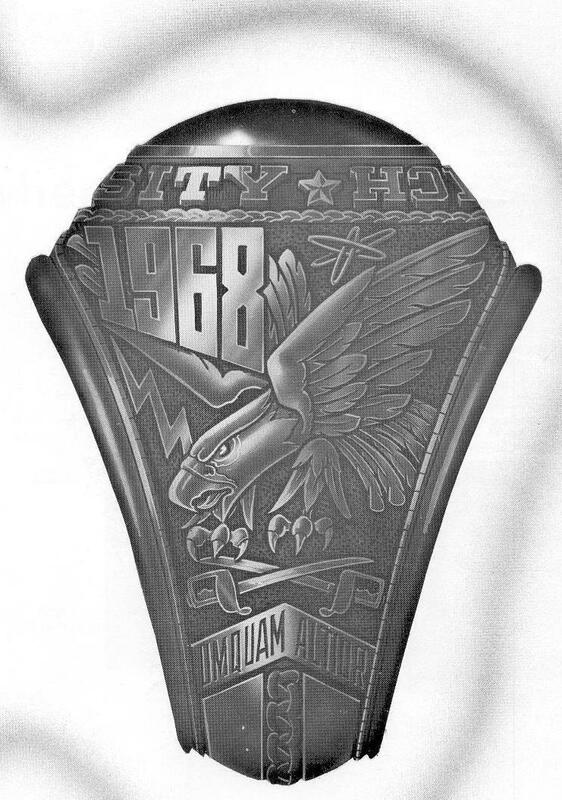 The centered rook piece represents “Rookdom”, the indoctrination period for each rook who earned the title of cadet and developed to become Norwich men and women of honor and integrity. The Class of 2019’s recognition date, February 7, 2016, is inscribed into the stone as it is etched in the mind of every cadet. Chains. We must be reminded that even though the Corps has changed over our long and distinguished history, we remain rooted in tradition. Each chain link is forged to represent the individual rook platoons. Although we come from many different backgrounds, we are united in our duty to our Class, the Corps, our University, and our Country. Sabers. From our founding days to the modern era, Norwich has held a distinguished reputation for producing outstanding Army officers in cavalry and armor regiments. Crossed sabers adorn our uniforms. Today, the sabers represent all four military service branches of the United States - Army, Navy, Marine Corps, and Air Force (bottom left clockwise). Castle. 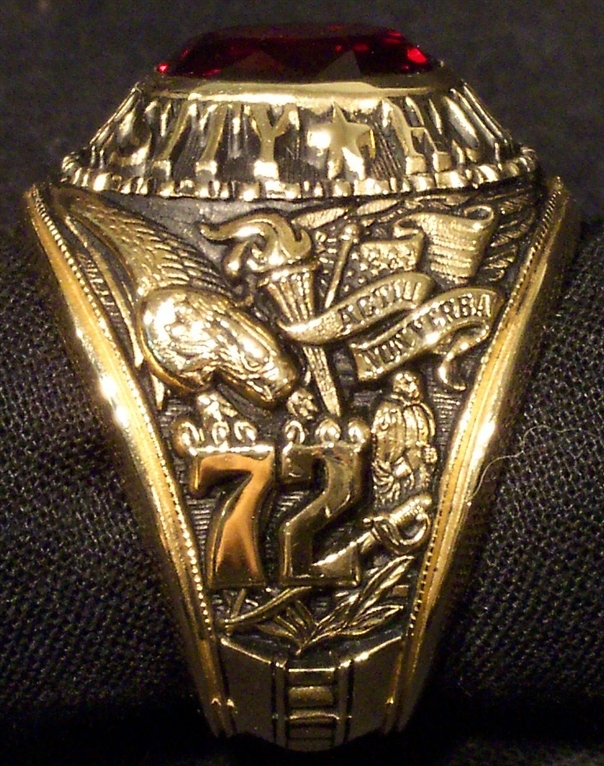 The rook piece displayed on the base of the ring’s class side represents Rookdom, the foundation of the Norwich experience. 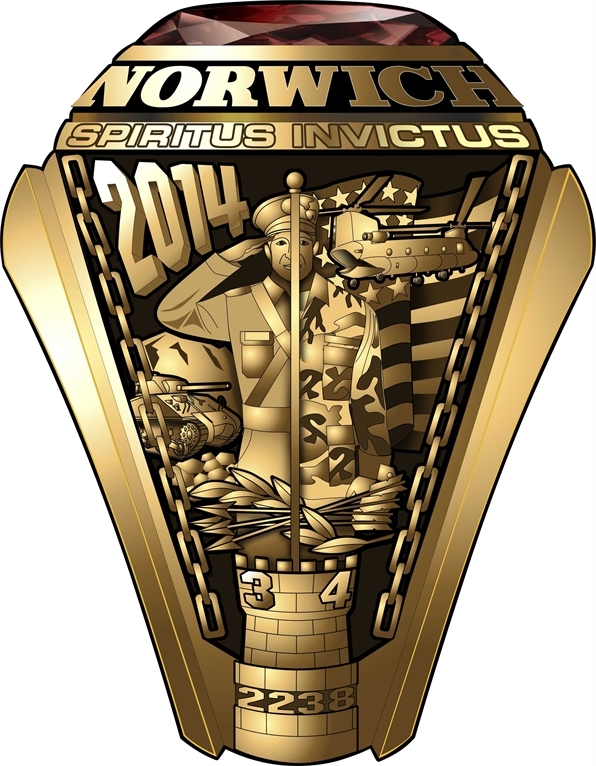 It is from that foundation that Norwich men and women of honor and character are forged. Flag. The American flag illustrates the fabric of our country, our citizens, and the enduring freedom we cherish. It also represents what we are willing to preserve and defend at home and abroad as a civilian, public servant, or citizen soldier. Chain. The chain itself represents our bond to those who came before us. The fracture in the link represents the ongoing challenge to maintain the ideals, traditions and Guiding Values of our beloved institution. Norwich Forever! Cannon. The cannon is a symbol of legacy and the time-honored traditions at Norwich. Its roaring blast has awakened generations of Rooks during Rook Week. In ceremony, cannon volleys are fired for our daily Reveille and Retreat, and to honor our distinguished guests and those who have paid the ultimate sacrifice in defense of our Constitution. It will be fired at Commencement when we stand unified as smart, confident, and morally grounded leaders ready to serve our nation. ROTC Scroll. Represents the 100 years since the Reserve Officers’ Training Corps formally established under the National Defense Act of 1916. 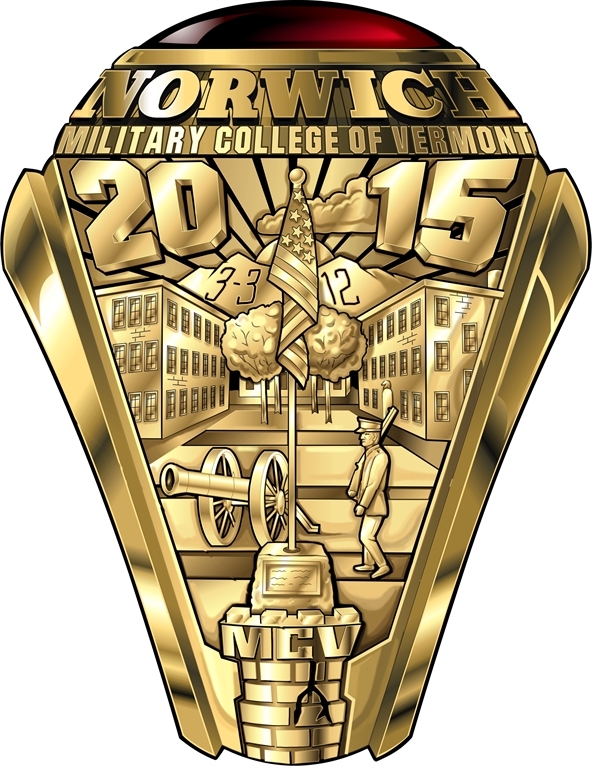 Norwich University is nationally recognized as the birthplace of ROTC. This senior military college in the Green Mountain State has produced thousands of leaders for our military and our nation since our founding father and visionary Captain Alden Partridge opened the gates to the American Literary Scientific and Military Academy on August 6, 1819 in Norwich, Vermont. Rising & Setting Sun. The rising sun symbolizes reveille welcoming the new day, new opportunities and new challenges. The setting sun bids us farewell in retreat as we near the end of our time at Norwich. The dawn and dusk exemplify the accomplishments achieved, and foretell the challenges to come and our resilience to meet what each day brings. Three Mountains: Paine, Dole, Turkey Hill. The Hill symbolizes the home we have made for ourselves at Norwich. These three mountains set a new scene; each mountain holds different experiences for us individually, but our days spent in the valley unify us as the Corps of Cadets. Vinculum Unitatis: “The Bond of Unity”. Through the many trials we have faced during our time at Norwich, we did not succeed as individuals, but as a unit. Our loyalty forged a bond that will last a lifetime. Dog River & American Flag: “The River of Freedom”. The Dog River represents where our journey began on the road to becoming Norwich Cadets. It was our first taste of freedom and our start of Rookdom. It flows into the American Flag illustrating our transition and struggle to become something greater than ourselves. The flag is dedicated to the United States of America and our commitment to this great country. Freedom will never cease to flow through our hearts and nation as we prepare to bear the burden of leading the future of America whether in the military or the civilian world. "The River of Freedom" will change through wear and tear, but the burning loyalty and dedication in our hearts will remain untouched. Sabine Field Scoreboard: As the Class of 2017, we were the first class to score on this field and stand at football games. On the scoreboard it displays the time of our recognition on 1/26/2014 at 2304. Memorial Plaza: Sabine Sally/Anchor/Propeller. On the opening day of the new Sabine Field, Sabine Sally, the Anchor and the Propeller were all refurbished and displayed proudly to represent the Army, Navy, Marine Corps, and Air Force; all branches of ROTC offered at Norwich. We are a campus that does not thrive on one ideal but on the ideals and commitment of many. Sabine Sally is a WWII-era M4A3 Sherman Tank, which was the most common battle tank used by the Western Allies in WWII. It is dedicated in honor of Norwich alumnus Captain James M. Burt ’39 who was awarded the Medal of Honor as an armor officer for his valor in the Battle of Aachen, Germany during WWII. The Anchor, obtained from the Naval Museum in Washington, D.C., is from a WWII aircraft carrier and represents our Naval Services. The Propeller is from the Curtiss P-40 Warhawk that provided air-support during the China Burma India Theater. This Air Force Memorial is a tribute to all past, present and future Air Force officers commissioned at Norwich University. Inverted Sabers: "Echo Taps". Our experience at Norwich was often punctuated by the solitude of "Echo Taps." These sabers stand as a remembrance of our time spent standing under the twilight sky in remembrance of the alumni, cadets, and service men and women who gave their lives for our country. Rook Piece: Indicative of the struggles we all faced our freshman year and the experiences that brought us together as a class for the first time. Although we might have been in different units, our journey in the Corps was the same. This experience has unified us with the present, past and future of Norwich history. The Roman Numerals on the Rook Piece represent our first day at Norwich, the start of our new lives, 8/18/2013. 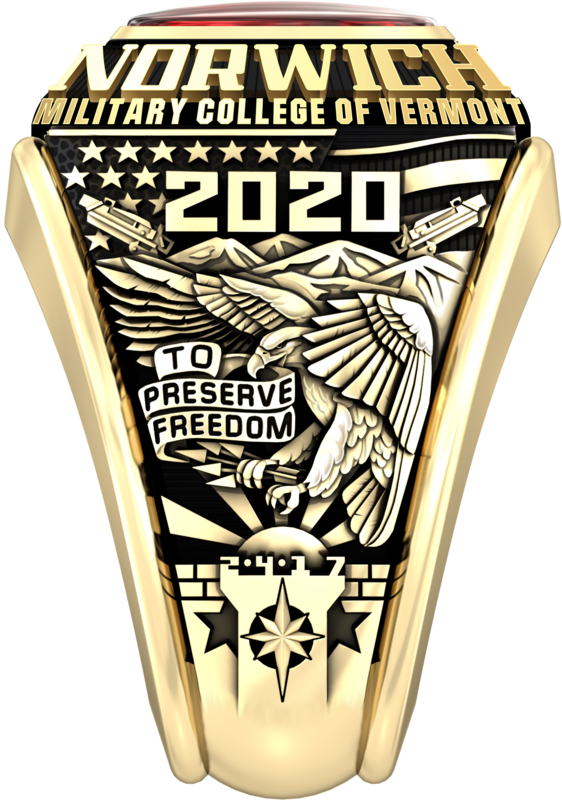 MCV Gates: MCV represents our arrival and completion of Norwich University education earning a degree from The Military College of Vermont. As we entered into Norwich onto the Upper Parade Ground we walked through the Goodyear Gates, modelled after the MCV gates; they welcomed us to the start of Rookdom. The gates are our link to the past, keeping the history and the pride of the Corps of Cadets, and the heart of our Alma Mater alive. Let us all "remain faithful to the past" in our bond of unity. Rook Piece: Symbolic of the struggles and strife we felt as incoming freshmen into Norwich University. The ‘12’ represents the year we became rooks, and the ski lift anchor on Paine represents the summit of our Rookdom experience. Inverted Sabers: Represent all the fellow cadets, alumni, and American service men and women who have made the ultimate sacrifice that allows us to remain a free nation. B: The Boston Strong insignia represents the heartache as a result of the Boston Marathon Bombing of spring 2013, and how it struck home to many here at Norwich University. It is in remembrance of the largest attack on American soil since 9/11. Dole Hill/Cemetery View: Location of our half Recognition Ceremony. A place of reflection on the past and future of our careers at Norwich University and the special place it holds in our hearts. Everywhere one looks from the campus or from one hill to another is reminiscent of different stepping stones or memories at Norwich University. The chiseled inscription on the Dole Cemetery monument, “I will lift mine eyes unto the hills,” reminds us of our three ‘hills’. The first hill is Dole Hill, where we completed Rookie Basic and became one step closer to becoming a cadet. The second hill is Norwich, the origin of the Corps of Cadets and our roots. The third hill is Paine Mountain where we completed our culminating event, climbing and overcoming the summit of our path to becoming a part of the Corps of Cadets. 75 mm Pack Howitzer: The cannon that was used to fire the shots marking the beginning and end of Rookdom and ushering forward our new careers as Norwich Cadets. Jackman Clock Tower: Frozen at the time of our Recognition, 2247 on 4 March 2013. Dog Tags: Represent the men and women who have selflessly served and will serve in the United States military. Also, in honor of the fallen Navy Seal, alumnus Chief Petty Officer Brian Bill ’01, and all other alumni who have or will give their lives in order to secure our nation’s freedom. American Flag: A dedication to America, our roots, and the hope Old Glory promises. The sixteen stars and stripes represent our class year at Norwich University. 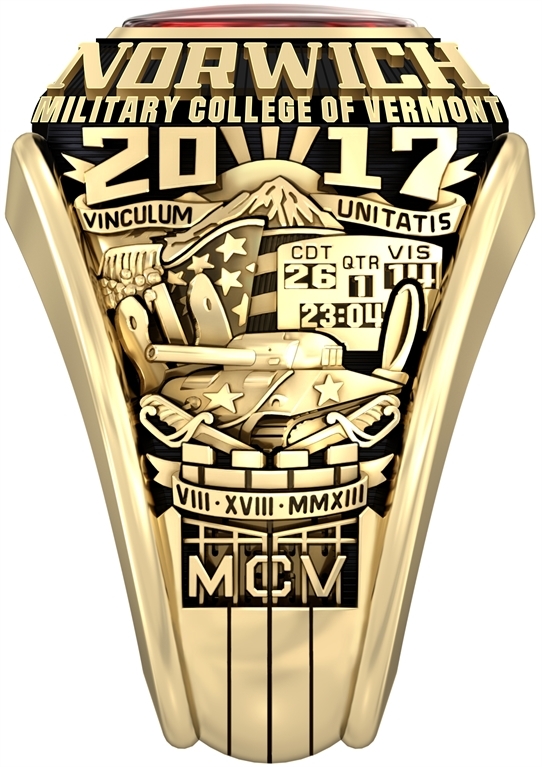 Bezel Design: Military College of Vermont - The stars on the bezel represent the four formative years we will spend at Norwich University. The Rook Piece displayed on the base of a ring’s class side represents the foundation of Rookdom. During each rising year as a cadet our intellect and our skills and confidence as leaders grew. The letters “MCV” inscribed on the top of the castle denotes Norwich’s distinction as the Military College of Vermont. The Crack in the Rook Piece signifies a sense of strength and resilience in the face of disaster and setbacks. Not even in the face of Tropical Storm Irene in 2011 could we be defeated. We held strong and worked together to prevail over the highest of obstacles. We will always hold true to ourselves that we will overcome life’s most difficult challenges. The Flag of the United States of America, unfurled from the original 13 colonies to our 50 states, represents our nation’s enduring freedom. On foreign lands or at home, we will defend her against all enemies foreign and domestic. The Cannon is a symbol of legacy, and the many traditions that have prevailed here at Norwich. Cannon blasts have memorialized our fallen, woken generations of rooks during Rook Week, commenced each of our academic years and served as a final salute to graduating classes. The Cadet Marching Vigil Tour is a symbol of the pride that we have in our school and our country. We recognize and honor all courageous Americans who have passed while fighting in defense of freedom and democracy. Cadets know the importance of looking toward the future while recognizing important lessons of the past and reflecting on the sacrifices of brave Americans. The Upper Parade Ground, since 1966, has been the bedrock of the Corps of Cadets. It was on this soil that we were physically, mentally and emotionally challenged through four years of blood, sweat, tears and triumphs. We stood tall and saluted in respect of our flag and our fallen. We forged a maroon and gold bond, not only with our classmates, but with generations of Norwich brothers and sisters that lead our nation with character and honor. The Trees on the UP grow every year and change with the seasons. Like the seasons, each year new rooks become cadets. Cadets become leaders and - firmly rooted in tradition - the Corps evolves. Even though we wear the cadet uniform for just four years, our lives as cadets and the values instilled bind us for life. The Barracks on the UP represent the home of the Corps of Cadets and the experiences within these walls that will be forever ingrained in our memories. By simply walking through one of the doors, we are reminded of our rook experience; earning a true place in the Corps and spending good times with our cadet family. Paine Mountain overlooks the campus and represents challenges and obstacles to overcome. Our motto, “I will try,” means perseverance in the face of adversity. Although life’s obstacles may be challenging, one must put in the effort, not give up, and drive his or her way to the top. March 3, 2012 is our rook recognition date; a date one never forgets. It was a milestone ending one of the longest and toughest experiences of our lives. Not all rooks who entered the gates on August 21, 2011, made it. Those who did were rewarded with the distinguished title of Norwich cadet. The Passing Cloud represents the temporary challenges we face today and tomorrow. During the darkest times of our lives, let a glance at our Norwich ring give us the faith and encouragement to march on toward the shining light ahead. The Year 2015 distinguishes our class from all others before and after. What proud legacy will the graduates of the Class of 2015 leave to Norwich and the world? Officium is the Latin inscription meaning “service.” As citizen soldiers we are all destined to serve our nation in some significant capacity. Whether we choose to serve in uniform or in civilian dress, by taking the more challenging path as a cadet we have demonstrated willingness to preserve our freedom and protect the ideals upon which our nation was founded. The Norwich Cadet. The military cadet represents all Norwich cadets past, present, and future. It is gender neutral, signifying we are all one. The cadet is split in half, wearing two uniforms. Summer Bs on the left symbolize the present, and BDUs on the right represent the uniform worn by our predecessors. Though the corps may have changed on the surface throughout the years, the proud military tradition and institutional legacy are still strongly intact, signified by a unified single cadet. Sabine Sally. Sabine Sally, a WWII-era Sherman tank, was taken off campus to be refurbished during the spring of our freshman year and is scheduled to return to Norwich before the graduation of our class. Sabine Sally is a mighty symbol of Norwich as the Military College of Vermont and a proud part of her heritage, which will live on through the decades. The Chinook. The Chinook helicopter represents our country’s involvement and dedication to our national defense in the Global War on Terror. It represents the 31 U.S. Special Operations troops, who paid the ultimate sacrifice when their Chinook was shot down in eastern Afghanistan on August 6, 2011 – the same day Norwich was founded in 1819. One of those killed was Norwich’s own, alumnus Chief Petty Officer Brian Bill, ‘01. The helicopter also represents the service members who made the fateful raid May 2, 2011 during our freshman year, which killed Osama Bin Laden, the mastermind behind the horrific 9/11 attacks on our country’s soil. Rook Piece. The rook piece is a staple of Norwich ring tradition. 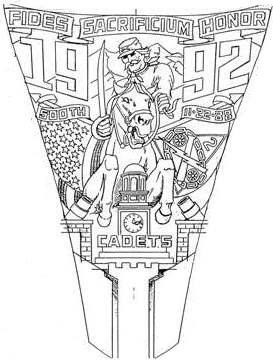 The six palisades on top of the rook piece represent the six rook training companies our freshman year and the numerals “3” and “4” depict the 3rd and 4th freshmen training battalions. The time, 2238, is when we were officially recognized as Cadets into the Norwich University Corps of Cadets. The Chain Links. The chain links represent the connection of the past to the future. 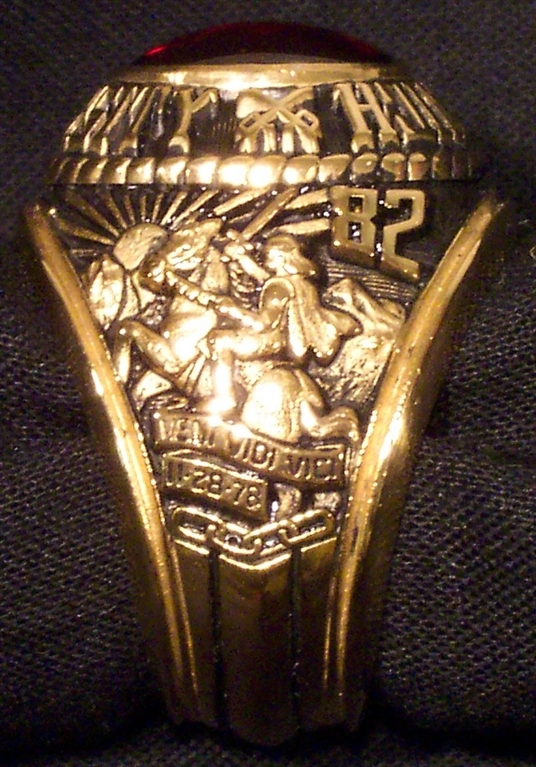 They signify the continuation of the Norwich Ring tradition and the long standing Corps of Cadets, first assembled in military ranks in Norwich, Vermont in 1819. We must continue to forge strong links in this chain, while upholding the tradition, honor, and prestige built by previous classes. Mountains. The mountains behind Sabine Sally represent Vermont’s beautiful Green Mountains where we have grown as a class, as cadets, and as citizens. We have trained and shed sweat and tears in these hills, all for the betterment of our Alma Mater and our country. The mountains also represent the rugged terrain of the Middle East. Here some of us will deploy as Norwich graduates to stand in harm’s way against all enemies foreign and domestic while defending this great Republic during the Global War on Terror. The Olive Leaves and Arrows. These represent both the strength of our class and our Nation, as well as our continuous striving for peace in a time of war. The four arrows, instead of the conventional three, serve as homage to the four years we spent at Norwich University being forged into future leaders, outstanding citizens, and service members. The Sun rising over Paine Mountain: represents new beginnings and the optimism each cadet must exemplify with each new endeavor undertaken. It shines a positive light on seemingly difficult tasks, such as the new organization of the Corps of Cadets. This hope and confidence we epitomize will allow us to succeed during our time here at Norwich and also in all challenges of our future. The Wings: signify protection, and the gripping talons symbolize the strength of our class. On one leg we have the military, and on the other leg we have the civilian world, but we see that they are connected to the same bird. The Thirteen Stars: of the traditional “Betsy Ross Flag” represent the Class of 2013, while the American flag represents the Class’ patriotism and dedication to the principles of the United States, such as honor and integrity. Nixor Fortiter: Latin for the phrase “Strive Valiantly.” As men and women who have chosen an unique and distinguished path, we shall face challenges mightier than that of ourselves and with these challenges lie great responsibility. We shall succeed and we shall fail, whilst there is no effort without error, and no effort without shortcoming. They, however, strive towards their goals; who know great enthusiasms with great devotion, are those who at worst, fail while daring greatly. Whether it is a commitment to military service or family, those who walk with confidence and do not falter when life strays awry, will reap the benefits they rightly deserve and will know only victory even in the face of defeat. The Compass Rose: represents the many different directions we take in life following our time here at Norwich. The four points indicate the four original companies into which our class was divided. The compass shows how our class is unified even with our individual units, and how together we are able to cover all possible directions in which we want to go. The Inverted Crossed Sabers: represent all the fellow Cadets, Alumni and American Service Men and Women who have made the ultimate sacrifice, which allows us to be here today. 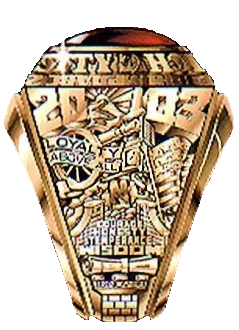 The Smaller Numbers on the rook piece represent the four companies that made up our freshman class while the larger “09” represents the year in which we all began our journey through our rook year, and although we have all moved on to new companies, we will always remember from whence we came. The Chain around the bezel embodies the bonds of camaraderie formed during Rookdom. Each link in the chain demonstrates the strong bonds forged during our freshman year. It shows the strength and unity of the class of 2012 in that we are only as strong as the connections we have made with our fellow classmates. The Ivy on the sides represents our development as a class and as individuals and it demonstrates how we matured from rooks into citizen soldiers. The 13 leaves of the ivy are attributed to the 13 original companies. The 13 leaves also represent the 13 original colonies in the American Revolution – the birth of the citizen-soldier. The Crossed Swords represent how intertwined the aspects of leadership are in that we must learn to follow before we can learn to lead. The NCO Sword represents how invaluable the professional soldier is not only to our development as leaders, but also shows the commitment of putting our subordinates ahead of ourselves. The Officer Sabre represents our commitment to our country and to our class, and that the lives of others are dependent upon our ability as leaders. The Sunset immortalizes the last year of original companies, as well as the dawn of a new Corps of Cadets, even though it leaves behind the traditions of the past. The Hills in the background symbolize “Norwich Forever, Queen of the Hills”. Through the ups and downs of our college career, we will always remember the determination that it took for us to reach the summit, which symbolizes our progress to recognition, our assimilation into the Corps, and ultimately our graduation. 2036 Is the time of our recognition on 1 MAR 2009. The Cadet Marching Vigil Tours symbolizes our respect and honor to the men and women of our armed forces, past, present, and future who have paid the ultimate price for our nation, our ideals, and freedom. "Go Forward Without Fear" Our quote shows that no matter what the Class of 2012 faces from this day forth, this quote will symbolize our resolve and adaptability to changing situations. We face each day as a new challenge. 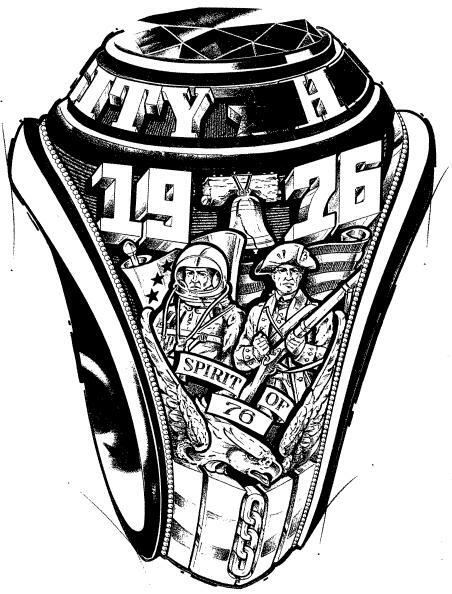 The Service Flag on the Rook Piece is to dedicate a piece of our ring to those who answered the call to our nation. 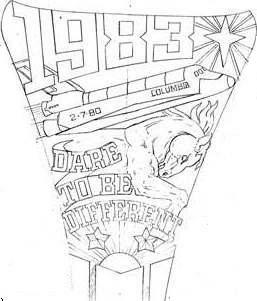 This year’s class design tells the story of the journey the Class of 2011 took together and the obstacles we have all overcome. The journey of our time at Norwich University begins at the top of the ring with the rising of the sun over Paine Mountain and ends with the doors closing at Plumley Armory. In between are the many symbols that tie our class together with its many achievements. Paine Mountain - Represents the obstacles our class has overcome and is a constant reminder of accomplishments we have made even through great struggle. Twin Towers - Everyone can remember where they were and what they were doing the morning of September 11th, 2001. Some call it the “Pearl Harbor” of our generation, the attacks perpetrated on that fateful day are a part of our history as Americans, and a major event in the history of our nation. Standing boldly as a strong reminder of the price of freedom, as well as the lengths at which some will go to destroy that freedom, the towers represent a turning point in many of our lives. For many of us it represents the inspiration and desire to serve our country; to some of us it was the reason why we choose to serve our nation, to others it reaffirmed their choice to serve. Whether we serve our country in its military or not, the towers represent a very important reason as to why our class will support and sustain this great nation. The towers form the “11” of the year of our graduation, marking the tenth year anniversary to the attacks on 9/11/01. We have not forgotten, and we will never forget. Rising Sun - Represents the beginning of our journey here at Norwich, from the first day of rook week on. It also represents the beginning of a lifetime of many strong bonds and friendships that we have made at Norwich. The Sun is always rising; we will never find ourselves in the darkness or alone because of the strong ties of friendship we have established with each other. Plumley Armory - Standing boldly, the doors of Plumley symbolize both the closing of our long and difficult journey through Norwich as well the opening to the future into the professional world. The darkness within the armory represents the unknown journeys we will take after we leave Norwich. As well, Plumley Armory is where our class was recognized, symbolizing the feelings of great accomplishment within our entire class. 3-5 is etched on the pillars on each side of the doors representing March 5th, the day we officially became a part of the Corps as Cadets. 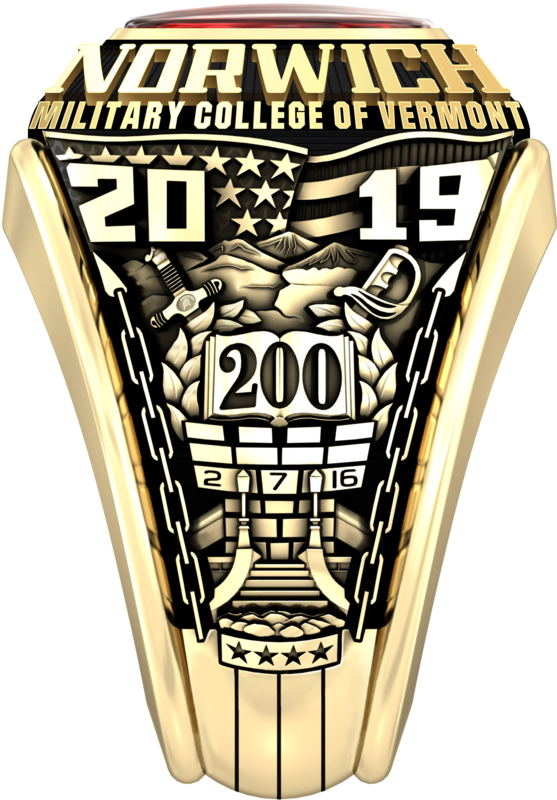 James Guns - Represents the heritage and military tradition inherent to the ideals of the Military College of Vermont and the pride we hold to be part of that history in the Corps of Cadets. 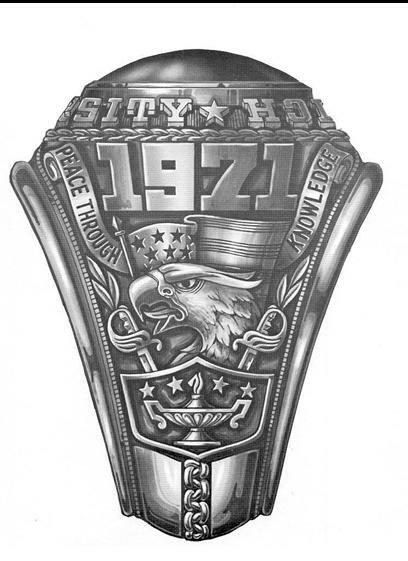 Rook Piece - Located at the bottom of our ring, it symbolizes our founding roots in the Corp of Cadets; that of “Rooks”. 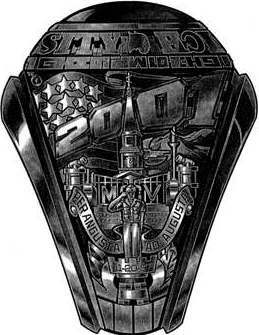 Etched into the Rook Piece is 2309, the time that our class became part of the Corps of Cadets. “Audaces fortuna iuvat” - “Fortune Favors the Bold.” - Written by the great Roman Poet Virgil, these words define us as those who are willing to stand in the face of adversity, hardship, our enemies, and endure. We are men and women of action. We will not stand by and let opportunity pass us, or let evil and any of its forms triumph. We will boldly rise to the occasion with an undying and relentless determination, with fervor and might, and we will succeed. Cadet with Dog River Rock - The Recruit in the Dog River is holding up a Dog River rock, a very important memento and symbol to every cadet at Norwich. A strictly Norwich tradition, it embodies the day we ran through the water of “the Dog” and one of the first times we really challenged ourselves and our rook buddies. The Recruit is wearing ACU’s for the transition our class made to being the first to be issued this new uniform. Dog River - Flowing through our ring, the Dog River stands as a symbol of the journey our class has taken from one of the very first tasks our class accomplished together on Dog River day. The Dog River also symbolizes the completion of rook week. Eagle - The symbol of our nation. The Eagle stands ever vigilant, willing to defend our country and the freedom of others if need be. It represents the patriotism, determination, and perseverance of our class. Fire Fighter - Representing all the brave and heroic men and women who have dedicated their lives and fallen in defense of freedom. The Firefighter holds a flagpole; planted firmly in the ground, it is a symbol of our dedication to stand firm in the face of terror and those who would take freedom from others. The flag represents the important attributes of liberty and justice that we all have sworn to protect. The eleven stars represent the year of our class in commencement and graduation. Snowflakes - The snowflakes represent the frigid Vermont winters and the Valentine's Day blizzard we all endured, and the perilous battle for the UP that occurred in its aftermath. Paine Mountain - looms over the horizon of the ring, an enduring symbol of Norwich reminding us of everything we learned both in the field, and in the classroom. Minuteman - The minuteman stands in the center of the ring, the epitome of the citizen soldier which we all strive to be. This symbolizes the readiness to take action against all enemies, both foreign and domestic, at any time, any place in defense of the Constitution of the United States. BDU Camouflage - gathers in the depths of the rook piece representing the uniform which the class of 2010 was issued on arrival, and the last ones to be issued them at Norwich. White Chapel - appears behind the minuteman, marking the spot where the meaning of "Honor" was embedded into our very essence. Buglers - Two buglers sound Echo Taps, a time-honored tradition in our nation's history, and a symbol reminding us of those brave warriors who have fallen protecting it. "Fortius Quo Fidelius" - (Strength through Loyalty) A defining term for the class of 2010, our steadfast dedication to both Norwich University and each other, forever. Howitzer - The pak howitzers' thunderous report echoes in our minds, reminiscent of the early mornings of rook week so long ago, as well as the day the Norwich Ring is presented. 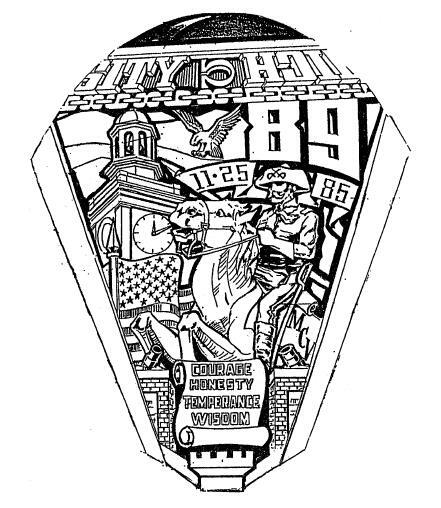 Preface - This year’s ring design tells the overall story of the adversities the Class of 2009 faced together and the goals we pursue. Our journey starts at the bottom of the ring with the Rook Piece and moves upwards through the many symbols of our time here at Norwich to the pinnacle of our trek, Commissioning and Graduation. Rook Piece - The Rook Piece represents the foundation that would allow us to build and grow to be men and women of Courage, Honesty, Temperance and Wisdom. 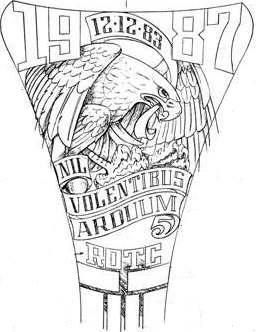 On the Rook Piece is etched 3.26.06, commemorating the night that welcomed us into the ranks of the Corps of Cadets. MCV Gates - The first symbol through which we passed, the MCV Gates welcomed the Class of 2009 into the Military College of Vermont. For the first time, we marched in formation through these gates, 355 strong. Together, we faced many challenges until recognition, when 278 Recruits became Cadets. Cadre Passage - After entering through the gates, we passed through a channel of those Cadet Leaders who would lead us through our freshman year. There they stood tall with military bearing, proud and confident, an example of what we would become. Cadet Saluting the Captain Alden Partridge Statue - Here stands a nameless Cadet saluting Captain Alden Partridge. This gesture of respect honors our past, celebrates our present, and anticipates our future. Statue of Liberty - Lady Liberty represents the connection we share as Americans with each of our classmates. No matter our separate backgrounds, we share the common bond of freedom and democracy. Artillery Piece - This serves as a reminder of the thunderous blast that woke us each day during Rookdom and continues to sound each morning when we render honors to the Colors. White Chapel - Displaying the time of our recognition, 2335 hours, the I.D. White Memorial Chapel stands to remind us of the Honor Code. It was in the Chapel we were taught that “A Cadet will not lie, cheat, steal or tolerate those who do”. Eagle and Ensign - The Eagle stands strong with wings expanding, fading into the American Flag to always remind us of the country we choose to serve. The nine stars represent the Class of 2009. “Vires Per Adversum” - “Strength Through Adversity” - This motto recalls both the obstacles faced and the perseverance demonstrated by the Class of 2009. 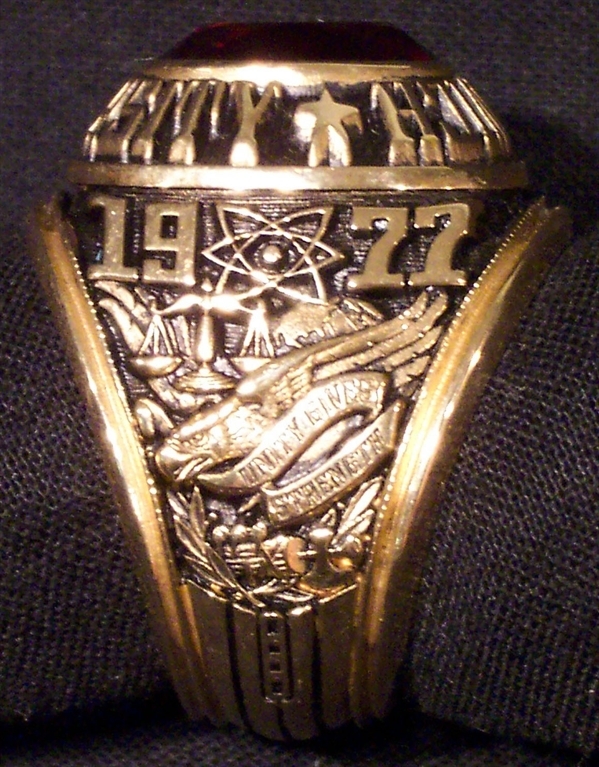 Service Flag - The Service Flag is shown as the highest symbol on our Ring. It reminds us of all of those who have paid the ultimate price of freedom through their selfless service and a chosen profession of arms many of us will enter. Jackman Hall: As the most iconic building on campus, Jackman Hall plays an important role in a cadet’s daily life. The time of recognition, 2335, is displayed on the clock tower. The date of recognition, 31 March 2005, is displayed on the molding below in Roman numerals. Rain & Lightning: Seemingly, it has rained during every culminating event for our class. It is commemorated on the ring to remind us of the road that brought us here and the storms we endured. US Armed Service Sabers: The officer sabers of the Army, Navy, Air Force and Marine Corps remind us of Norwich, the birthplace of ROTC, and the cadets who earn a commission and honorably serve our country. Eagle: The bald eagle, with its outstretched talons grasping its prey, represents our great nation and the zeal with which all cadets will undertake their future endeavors. American Flag: Our nation’s colors serve as a backdrop, representing the liberty and justice we hold so dear, bearing eight stars for the year in which we will graduate. The flag waves in the background, reminding us that even though we may not see it every day, the stars and stripes of America are always in our hearts and minds. Tunic: Symbolic of the uniform we wear daily, it represents the moral high ground Cadets choose by wearing it. This is what sets us apart from our civilian counterparts across the country. Medal of Honor: In remembrance of Captain James M. Burt, USA ’39, the last living Norwich Medal of Honor recipient, who died 15 February 2006. It also signifies the courage, valor and selfless service exhibited by Cadets, specifically those who have received that distinction. KIA Memorial: The helmet, positioned on an M-14 rifle and combat boots, honors those who have died in battle. The rifle is the model Cadets drill with at Norwich, reminding us of our graduates who have and will pay the ultimate price in defense of our country. Roman Numeral XIV: At the commencement of our Rook year, the corps grew to fourteen companies for the first time in twelve years with the addition of Kilo, Artillery and Cavalry companies. Mors Ante Infamia: “Death Before Dishonor”. Selected by the class, this motto represents the code of honor. One of the four cardinal virtues of a Norwich Cadet: courage, honor, temperance, wisdom. The ring embodies our honor code and binds those who wear it to forever exemplify Norwich men and women of honor, character and integrity. Sword Pierced Heart: The three swords signify the long and arduous journey of Rookdom. In the beginning, we arrived not knowing what to expect, in the middle we endured trial by fire with the longest Rookdom in 30 years, and in the end, we were accepted into the ranks as Cadets. MCV Gates: Erected to designate Norwich as the Military College of Vermont. The open gates welcome us back whether in spirit or actuality. The gates remind us of the paths taken by those who came before us. Eagle: Bearing the weight of the mountains upon its wings, the eagle represents our nation in time of distress, waging the price of war not only overseas, but within its own boundaries. American Flag: Serving as our background, the flag holds four stars. The emblem of liberty, each star upon the union represents a branch of the armed services, offered at our university, fighting to keep our colors free. Dog River: Denoting a journey traveled, the river carries memories of the day we ran through it, but keeps moving along as to not lose focus on the reason for why we are here by looking back. White Chapel: Fixed with our arrival date, the clock is stopped at 8:15. Embodying the spirit of the honor code, it was in the chapel where we learned to embrace the principles of an oath we chose to live by. James Cannon: Representing our heritage, the cannon is placed upon the ring to remind us of the years of tradition that we have become a part of. Moon: A symbol of guidance, it is the light that was shed upon us as we marched up Paine Mountain that led us to our recognition on that evening. 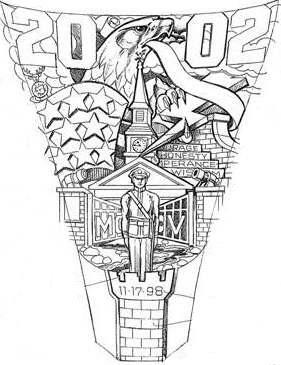 Rook Piece: The cornerstone place or foundation of our crest, it reminds us where we have come from. Paine Mountain: Signifying the beginning and the end of our Rookdom, the mountains in the setting represent the ascent taken to become a cadet in the corps. Centennial Stairs: A symbol of a rite of passage earned, each step carries a semester of training completed. 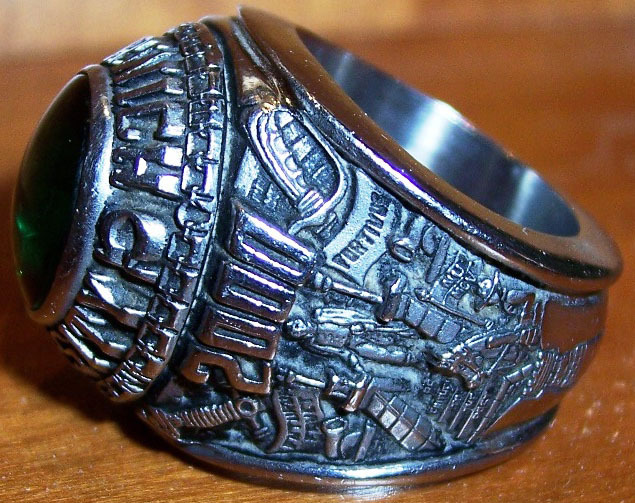 It is six semesters in the Corps of Cadets that give us the right to wear the ring. It is these steps that represent a path of where great men have walked before us. Cadet: Standing proud, the cadet renders honors to the men and women serving our country in a time of war, fighting for the freedoms we cherish. The cadet exemplifies what each of us are and what we aspire to be. Date: Inscribed on the first step is our recognition date, 10 NOV 03. MCV Gates: Marking the entrance to the Military College of Vermont on the day of our arrival as rooks, it is a reminder of how far we have come since then. The Setting Sun: Soberly reminds us that our time as cadets is nearly over and that the memories and bonds forged at Norwich will withstand the test of time and remain with each of us as long as the sun rises anew each day. Rising, the sun symbolizes the coming phase in each of our lives. It is a call to each to prepare for our respective duties, as officers, business leaders, alumni of Norwich, and most of all, citizen-soldiers of this great land. Paine Mountain: The first of many challenges we met as a class. It reminds us of our sometimes rocky journey through the paths of our Corps, and the ties that we shall forever have to the Green Mountains of Vermont. White Chapel: The place in which we said goodbye to our parents on Rook Arrival Day. From that sanctuary we left the bonds of childhood and passed through the doors into Rookdom. The proceedings of our Honor Committees take place inside the Chapel. A continual reminder that we, as cadets, are called to live by a higher standard, to live with honor and integrity in all we do. A focal point of our beautiful campus; a place of rest, prayer and worship. The Clock is stopped at 1206, the time of our long awaited recognition. In the dark we stood as one class, weary from the trials of Rookdom, and accepted the new challenge of being a Cadet in this Corps. It was a fragment of time we shall never forget. 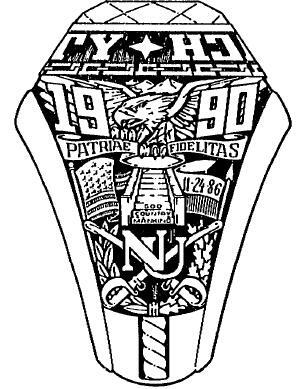 Our Class Year: The size reminds us of the fullness of our experiences at Old NU, and is visible atop the ring to show our class pride at all times. United States Flag: The symbol of our nation and our duty to defend her against all enemies foreign and domestic. We are called to be “moral, patriotic, efficient, and useful” citizen-soldiers in order that we might better protect these bits of cloth that represent the ideals of our founders and the blood of our Alumni. There are six stars for our class year “06”, with one star being partially covered, showing that not all those who squared in the Gutter with us will be there to walk the stage with us. The 10 stripes of the flag represent each of the companies of our freshman class. Pack Howitzer: The cannons that welcomed us with a roar to “The Wick”, blasted their salute to us as we were recognized into the Corps, and will thunder their praise as we receive “The Ring,” and then again as we leave the Corps at graduation. The Artillery Battery was also reactivated as a freshman company during our time on The Hill. As the newer of the two cannons, it represents Goodyear Hall, one of the two buildings that housed our Rook Class. James Gun: Tradition and heritage are the facets which hold our cardinal virtues as the foundation of this Corps. This gun embodies the pride we have in the history of our Corps of Cadets and commemorates the founding of Norwich as an artillery school. It also represents Alumni Hall, the oldest barracks building on campus and one of the two that housed our freshmen class. Per Unitatem Vis Scroll: Our class motto, Strength Through Unity. As individuals we entered, as one we have pressed through the challenges. Now the Corps is in our hands. The Numeral 50: Commemorating the 50th anniversary of the Honor Code during our Rook year. We are bound by honor and called to live by this code as cadets. Rook Piece: The central and largest part of our ring, symbolizing the length and significance of our Rookdom, which lasted half our freshman year. It bears our Recognition date: 10 December 2002; six days shy of the four months that we called Rookdom. After Super Saturday we shall never forget this day. Sword: The symbol the Medieval Knight’s chivalry. As cadets we are called to live by this ancient and sacred code of honor, courage, virtue, and loyalty. Accurately depicts the nature of the relationship between cadre NCOs and us as Rooks. Our cadre were hard because they cared. Drill Sergeant’s Cover: A reminder to us of the exceptional cadre who trained us, hardened us, and chiseled us into cadets. It was their job to make us fit for their Corps, just as we now have the responsibility of making another class fit for our Corps. Lighting Bolt: A symbol of courage and strength. The Setting Sun: As our time at Norwich is in its last hour. Secret societies were all thrown out and banned from the University; this showing their legacy. The sun sets behind the great Green Mountains of Vermont, including the school's very own Paine Mountain. The Eagle: Our National symbol of honor. He bears the 911 scroll and holds the three arrows (Air, Land and Sea) to signify the country in control and the three ways we fight. The eagle's wing turns into the American Flag to act as our backdrop. 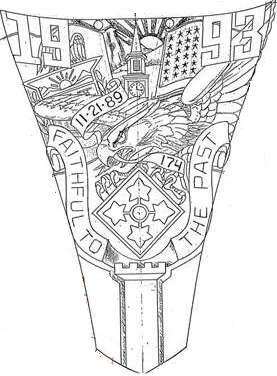 Rook Piece: The cornerstone piece at the bottom of our crest. It reminds us of where we have come from. Jackman Hall: Featured because the building holds all of the figureheads on campus. It emphasizes the idea that the Corps runs itself under the mentorship of Jackman. The original building was also the original barracks of Norwich at Norwich, VT. The clock is stopped at the time of our recognition, the time we joined the ranks of our fellow cadets. Date: Inscribed is our recognition date - 14 NOV 05. The Centennial Stairs: A symbol of a rite of passage earned. The first step is of the first recorded alumnus (Captain Phillip Vincent Sherman '07) to die in WWI. Each step carries the name of a distinguished official, alumnus, or student. The main idea is to walk the path where great men before us have walked. The South Gate: through which every cadet passes, ties our class to the institution and all its alumni who wear the ring. The Rook: represents our humble beginnings at Norwich. The Eagle whose wings unfold with honor and pride. The American Flag: forever waving in the midst of freedom. The White Chapel Clock: forever showing our time of recognition as cadets. The Mountains: an everlasting symbol of the obstacles we have crossed. The Bezel: the alpha and omega symbolizing our beginnings and successful end here at Norwich; and brings the class together one last time. Honor Obligati: "Bound By Honor". Our Class Motto. The Crossed Sabers: The cavalry tradition of our cherished Alma Mater. The Rope: Connected to both crests, forever ties our class to our institution and its alumni who wear the ring. The Jackman Tower Clock: Forever showing the time of our recognition as cadets. The Bezel: The star of justice and the star of honor, forever encompassed by the linked chain of the class. Here, in this ring, is the history of our class. The Eagle: Eyes ablaze, wings spread, talons bared. Here is strength, power, nobility of purpose. Patriae Fidelitas: Our class motto. 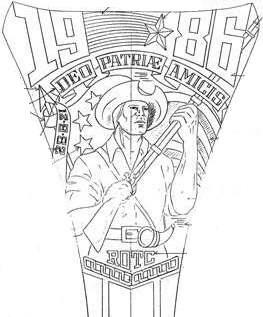 Latin meaning "Loyalty to Country". The Eight Centennial Steps: Symbolize the eight semesters we spent together on the Hill. 11/24/86: The day we were recognized as cadets. The Crossed Sabers: Our tradition of cavalry bound by the honor and courage symbolized in the laurel and oak wreath. The Rope: Connected to both crests, forever ties our class to our cherished institution. 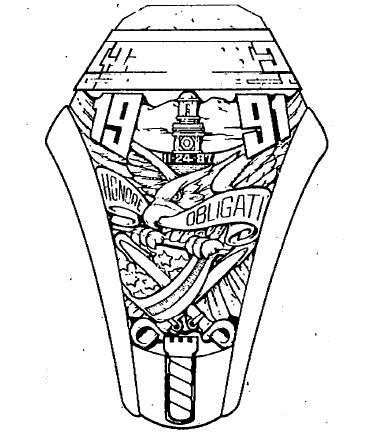 The Bezel: The Rook in '86, to Polaris Star in '90, portrays our transition from recruits to leaders. Jackman Clock Tower: The Jackman clock tower remains frozen in time at 12:10am, the hour and minute of our recognition as cadets. The Spread Eagle: A symbol of American courage in times of war and peace. 11-25-85 Scroll: The date of our recognition as cadets. The American Flag: A symbol of patriotism and the country we swear to protect and defend against all enemies foreign and domestic. 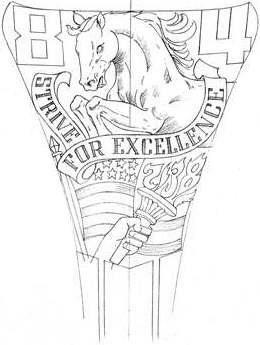 The Cavalry Soldier and Horse: Symbolizes our long standing Cavalry tradition on "The Hill". The MCV Gates: The gates we entered as Rooks and exited as men and women of honor and integrity. Guiding Values Scroll: These are values that were instilled in us as rooks, that we will take with us into the outside world to conduct ourselves honorably. Tout Bien Ou Rien: Class motto, Everything done well or nothing attempted. Mountains and Rising Sun: A new begining. Lamp of Knowledge: Knowledge attained at Norwich. Book Opened Four Pages: Four years at Norwich. The class of 1970 was pursuing an education during a time of national conflict. To symbolize the class as a dynamic organization, an agressive eagle was chosen. A banner, bearing the motto "To preserve freedom," is clutched firmly in the eagle's mouth representing our class' unity of purpose in achieving that goal. The quill denoting the pursuit of knowledge and the olive branch of peace are crossed in union. This is accented by a strong saber to symbolize our efforts to secure freedom.